Terry worked hard to get our Condominium complex into the schedule before Hurricane Sandy hit. Our old gutters were 5", too small, and rain was pouring over them and flooding the doorstoops and foundation area, eventually making its way into my basement. The new 6" gutters look great and take care of the problem of rain pouring off the roof. I'd recommend Smartcare in a flash to anyone. Emma in the office was friendly and fast. The install crew was friendly and did a great job. Terry's crew of roofers could not have been better. They were incredibly hard working under a less than ideal location. Our home is a long way from the parking lot and the roof is quite pitched with houses within twenty feet on either side. The crew was efficient and highly cooperative. Everything came together beautifully. We now have a lovely new roof, skylights and shades. Terry was very helpful and knowledgable and was available to us throughout the process. We are happy to speak with anyone about the great job they did. First and foremost, Smart Care Exteriors far exceeded the work I needed to replace my roof. The owner was professional and worked with me culminating my needs, price, type of roof, along with choosing color to define my roof. I interviewed over 4 roofing companies and found Smart Care Exteriors to be most experienced in their field and far exceed the others. Terry (owner) took the time making suggestions and giving me options. Not only did the owner replace my roof, but he had to realign a portion of my roof with new plywood and beams. I highly recommend his team and Terry's expertise to meet anybody's needs. These guys are responsive and reliable. Their prices are fair, and their work is professional. I wouldn't call anyone else. Bruno came to my home in Newtown, CT to repair a window. After evaluating my home he saw that it was leaking and later found out there was damage to the roof. Right away, he was able to repair and do my whole roof. This saved me a ton of money instead of minor repairs that would have temporarily solved the problem and would have added up. We had the roof done recently by another roofing company before I hired Bruno and Smart Care Exteriors. The first company I used – I will never use again. I will go to Smart Care for all of my future roofing and gutter needs. Thus far, I have referred all of my friends to Smart Care Exteriors as well and we couldn’t be happier. Second time you've done work for us. Very happy with your service and would use your company again. Everyone was great. Clean up was done as explained. Crew was very friendly...Great Team!!! Bruno was very informative about the process he would be using for my job. The crew arrived on time on the day that I was given to start and cleaned up very neatly. Thank you ! Terrific job!!! Very easy, are pleasant to deal with, and the problem was handled quickly with minimal effort on my part. Overall terrific job! Would certainly use this company again and recommend to others. "Excellent service at a fair price. Frankie, who scheduled the work was friendly and timely with good follow through. Pat, who..."
In 1990 Terry Rooney had a small business called Rooney Renovations. As the company expanded and the need for resources grew as well, Terry, with the help of Bruno Maini, opened Smart Care Gutters in 2003. Gutter installation was the primary focus of this company, but as the demand for roofing became larger for Rooney Renovations, the merge of Smart Care Gutter and Rooney Renovations was the next step. Terry Rooney has been in the construction industry since 1989. His evolution from Rooney Renovations to Smart Care Exteriors came in response to local homeowners' need for both roofing and gutter installation. Terry partnered with Bruno Maini in 2003 to open Smart Care Gutters, and the inevitable merge of the two businesses now offer a cohesive gutter and roofing service in the Fairfield and New Haven county areas. Bruno Maini began his career with solid customer service and management experience, which he enthusiastically applied to Smart Care Gutters in 2003, a company he started in partnership with Terry Rooney, and later merged with Terry's business into Smart Care Exteriors. His attention to detail, pride in his work and passion for his client's happiness has resulted in many lifelong customer relationships. Today we are proudly called Smart Care Exteriors serving homeowners in Easton, Redding, Bethel, Newtown and all other towns in Fairfield and New Haven, CT counties. We offer a wide range of services to our valued customers including roof installation, gutter repair, gutter cleaning, and much more. Smart Care Exteriors has a team of highly trained employees that will meet with you to determine the perfect plan of action for your home. Although we are not currently a member of the Better Business Bureau. 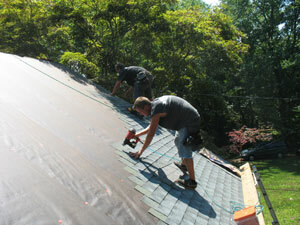 We have an A rating and are one of the only 60 Certified GAF Contractors located in Connecticut. We are proud of our GAF Master Elite Weather Stopper certification status and use only the best products and techniques to bring GAF's expertise to your home. We do everything we can to receive the highest amount of training and certification so we know that each job is done correctly the first time. Smart Care Exteriors' team does their best to build a good business reputation and many lifelong customer relationships. Over the years, we have been involved with New Canaan Congregational Church and the Hope Foundation of Biloxi, Mississippi. To help support these causes the team has donated their time to rebuilding homes that were damaged in Hurricane Katrina. The Smart Care team is also involved with The Friends of Jimmy Miller Nonprofit Organization located in New Haven, CT. Terry is a committee member and has been for five years. This committee has raised over one million dollars and donated to St. Francis Home for Children in New Haven, Clifford Beers located in New Haven, Mount St. Johns in Deep River, and Hospital of Saint Raphael. We love to give and have done this by making donations to the Christ the King Church in Trumbull, St. Stephens Church in Trumbull, The American Cancer Society, local soccer, softball, and other sports teams, Alex's Lemonade Stand (for childrens cancer), Swim Across the Sound (annually), and The Jimmy Fund. Smart Care Exteriors truly cares about the community and strives to help out in any way they can. For a free roofing or gutter quote, call or-email us today!